If you've been reading this column for the past few seasons, you'll know that I like to use Sports Club Stats to highlight the chances each team has to finish in a particular position; over the last few years, it's been examining the race for third or fourth, so it's a nice change of pace to be able to talk about title chances. The chart at left highlights the current odds each team has to win the Premier League this year, based on a million simulations of the upcoming fixtures, taking into account the results up to this point. As you can see, it's absurdly even. So, what does this mean right now? Absolutely nothing. There are 14 games to play and Arsenal still have to play all four of the others teams represented in this pie chart, plus a number of other tricky matches to boot. If Arsenal win those games, the first of which comes tomorrow at Anfield, then their slice of this pie stands to grow larger as the list of remaining matches shrinks. If Arsenal start dropping points, their title hopes will drop with them. With "DeathRun 1" starting now and "DeathRun 2" to follow in March, Arsenal cannot afford to drop points in big matches. For those of you who complain about the media not giving Arsenal's title hopes the time of day, it's put up or shut up time. Arsenal need to win games like these. There's some good news in the injury list this week, as Mikel Arteta, seen limping at the end of the Crystal Palace match last week, should be fine to play tomorrow. In addition, Jack Wilshere has been moved to the "facing a fitness test" category with his ankle problem. After the match he had on Sunday, however, I would suspect Alex Oxlade-Chamberlain gets another crack at playing centrally, alongside Mikel Arteta. Alternatively, Arsene Wenger could opt to use Tomas Rosicky, as he often does for experience in matches like these. As for the other questions: does Nacho Monreal retain his place at left back or does Kieran Gibbs get a start? Nacho has started six of the last seven Arsenal matches across all competitions; he was left on the bench for the cup tie against Coventry City. The other question centers around whether Lukas Podolski will earn his second straight start. Color me pessimistic on that one. I can see Wenger opting for the Ox centrally and Rosicky in the more attacking role. Predicted XI: Szczesny, Sagna, Koscielny, Mertesacker, Monreal, Arteta, Oxlade-Chamberlain, Ozil, Cazorla, Rosicky, Giroud. Liverpool are stretched thin at the back, as center backs Daniel Agger (calf) and Mamadou Sakho (hamstring) will again miss out, while long-term injured fullbacks Glen Johnson (ankle) and Jose Enrique (knee) remain out as well. The Reds will liekly start with Martin Skrtel and Kolo Toure in the center of the back four, while Aly Cissokho and Jon Flanagan should start at the fullback positions. The Reds will likely field a 4-3-3, with Steven Gerrard, Philippe Coutinho, and Jordan Henderson in midfield and an attack trio of Raheem Sterling, Daniel Sturridge, and Luis Suarez. Sturridge and Suarez have started 11 matches together up top for Liverpool this year and at least one of them have scored in 10 of those 11 matches; the only team to keep both off the score sheet in such matches? Arsenal. The 4-3-3 is a tactical switch from earlier this season, when Liverpool was playing a 3-5-2 with two wing-backs and three in the middle of defense; Flanagan and Cissokho were the wingbacks when these teams met at the Emirates, while Toure, Skrtel, and Sakho started in the middle. At halftime, down 1-0, Cissokho was removed for midfielder Coutinho, himself returning from injury, as Liverpool were chasing the game. Predicted XI: Mignolet, Flanagan, Toure, Skrtel, Cissokho, Gerrard, Coutinho, Henderson, Sterling, Sturridge, Suarez. 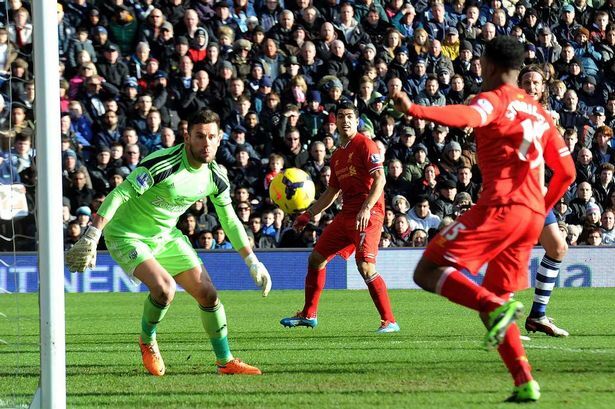 Liverpool's blip came a little later, as they played City and Chelsea over the holiday period (December 26 and 29.) As such, their unbeaten run currently stands at seven, with two FA Cup wins, three league wins, and two draws. The wins have been dramatic (4-0 over rival Everton, a 5-3 over Stoke included,) but they have not been numerous. Last weekend, West Brom came from behind to earn a 1-1 draw against Liverpool at the Hawthorns; given the Baggies' recent form, that result is two points dropped for the Reds, while the same scoreline earlier in the season was largely considered one point gained for Arsenal. Funny thing, sports; it's not who you play, it's when you play them. Liverpool have lost just once at home this season, to Southampton in September; Aston Villa took a point from Anfield two weeks ago. Arsenal on the road have lost just twice in the league, both times in Manchester. They've also drawn at West Brom and Southampton. In road games, Arsenal are tied for first place with eight wins, two draws, and two losses. Somehow, they're tied with Spurs in that respect; thing is, Spurs are 11th in the league at home. in the reverse fixture in November. Arsenal are unbeaten in their last four meetings with Liverpool and the Reds have beaten Arsenal just once in their last 12 fixtures; that win came 2-0 early in the 2011/12 season. You might recall that match as when Emmanuel Frimpong was sent off and Arsenal made Samir Nasri start even though he was already practically wearing City blue. 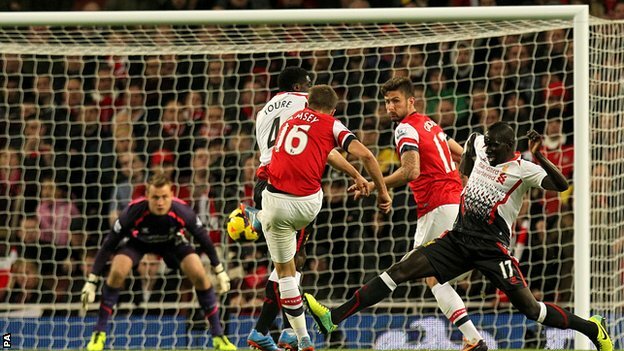 Since then, Arsenal have beaten Liverpool on three occasions and came from 2-0 down to draw 2-2 on the other. Arsenal have not lost at Anfield since the 2008 Champions League quarter-final, though it was the two-goal margin of that loss which saw the Gunners out of the tie (thanks, Kolo Toure.) The last time Liverpool won the league fixture against Arsenal at Anfield, Peter Crouch had a hat trick and William Gallas scored Arsenal's goal in a 4-1 match on March 31, 2007. Across all competitions, eight of the last 16 meetings between the clubs have ended drawn. was funny. I guess he is just stretching. I'm sorry. The referee is Northumberland-based Michael Oliver. Arsenal have seen Oliver twice this season, each occasion being a rather huge match. The Gunners beat Spurs 1-0 with Oliver in the middle back in early September, but also lost 1-0 to Manchester United with Oliver as the referee in November. I went back to the United preview to see what else I have said about Oliver in the past, only to find that I called the fixtures he tends to work for Arsenal "rather huge" then too. Three months later and I'm using the same language flourishes; I suppose I'm not that creative. This will be Oliver's third Liverpool match of the season as well; the Reds previously drew 2-2 at Swansea and beat West Ham 4-1 at Anfield. The youngest referee in the Select Group, Oliver turns 29 on February 20.